The penultimate day of the Cape Pioneer Trek international mountain bike stage race in South Africa’s Western Cape province added another twist to the 2016 tale with the rugged terrain delivering more tyre challenges that led to a shift in the overall podium positions with one day remaining. 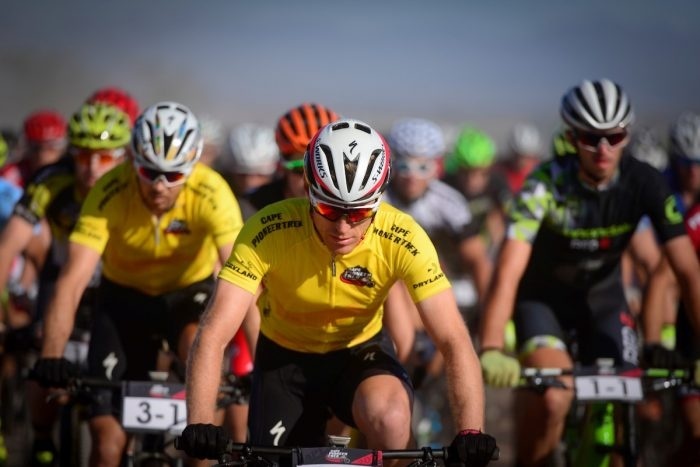 South Africans Matt Beers and Erik Kleinhans (Full Suss/Topeak Ergon/Red-E) stormed to yet another gutsy stage win to give them a total of four in six days. They moved up the General Classification to fifth, but it was ahead of them where the biggest shift occurred as Team Spur’s James Reid and Julian Jessop swapped places with The Dutch duo of Erik Groen and Jeroen Boelen (Stappennbelt Specialized) dropping down to fourth. The Dutchmen had an early puncture and spent most of the stage chasing alone, which saw them lose almost five minutes to their primary rivals. But for Kleinhans and Beers, it was a matter of hunting down another stage win after having lost any hope of a final overall podium after surrendering so much time on Day 2. It was their third stage win in succession on a day that saw the unforgiving terrain leave the race splintered, with teams finishing in ones and twos. The Imbuko Freewheel Cycology Momsen pair of Chris Wolhuter and Dylan Rebello set the early pace with a brazen attack shortly after the start. But the pair were reeled in after 35km once the terrain became more challenging. After a couple of days of dealing with tyre issues, race leaders Combrinck and Bell were back to their proactive selves, but were once again victims to a flat tyre, as were many other teams. 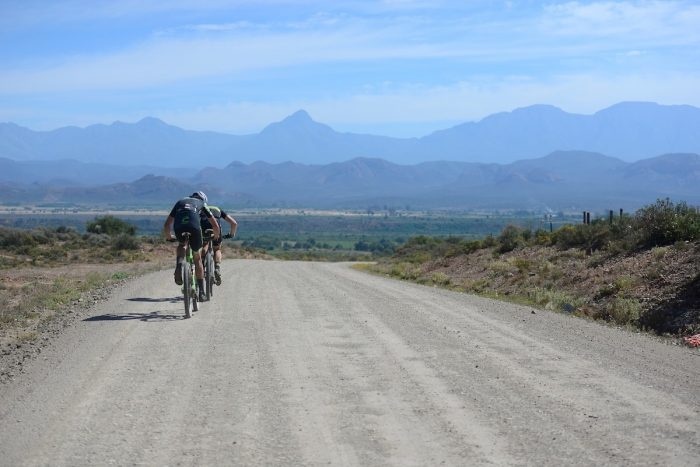 Kleinhans and Beers escaped the tyre ire of the Karoo and clocked a winning time of 03 hours 18 minutes 11 seconds, almost two minutes clear of Estonian duo, Peeter Pruus and Peeter Tarvis (KOMO/RMW), who recovered well from two early punctures. Third place went to Reid and Jessop, another two minutes back. “We took a different strategy because once the racing got serious, Bell and Combrinck started off attacking and we thought it would be a more defensive day for us. But on the first technical downhill they were quite cautious, obviously trying to protect their tyres. Matt and I just went hard on the technical downhills and that seemed to give us an advantage so we just pushed on from there,” explained Kleinhans. In the women’s race, Cherie Redecker and Mariske Strauss (OMX Pro) remained the dominant team, collecting another stage win and further extending their GC lead. They rode much of the stage with the winning Mixed team, Yolande de Villiers and Neil Ungerer (Ultimate Cycling), who added another four minutes to their lead going into the final day on Saturday. Igna de Villiers and Fanie Venter (LGE Midas BusinessPrint) won the stage in the Veteran men’s race and extended their lead. Their main rivals, Vickus Boschoff and Iniel Hattingh (Klein Karoo Ko Op), had a difficult day with tyre drama and dropped from a close second overall to a distant third behind Belgians Hans Planckaert and Wim Tollenaere (Der Fietser Rotwild Zaes). Leading Masters, Linus van Onselen and Izak Visagie also endured tyre trouble on Friday. However, their significant lead allowed them ample time to manage their crisis and still win the stage and stay out front with a day to go. In the Solo men’s race, Jiri Krivanek captured his fourth stage win to extend his overall lead, while the Solo women’s race saw its tightest contest yet, with Nicky Giliomee maintaining her perfect record, winning the stage and adding more time to her overall advantage. 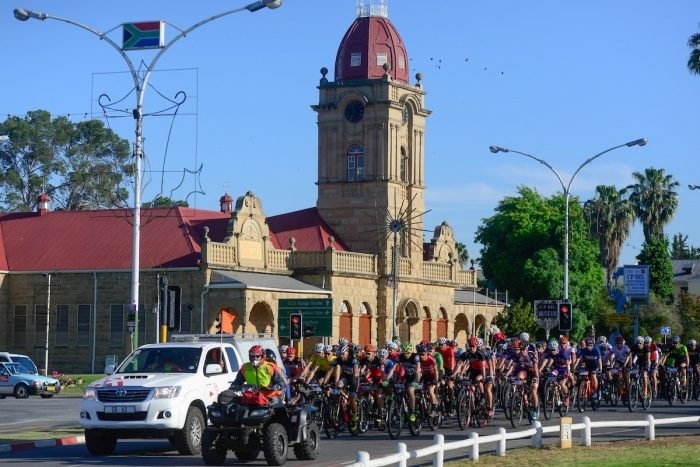 Saturday’s final stage is a relatively brief 57km, starting at the Chandelier Game Reserve and ending at the Queens Hotel in the town of Oudtshoorn. It climbs a total of 1200 metres and is sure to be an intense contest as teams vie for a final shot at a stage podium finish. The action will once again be covered live on Twitter, so follow @CapePioneerTrek. For more indepth route descriptions and other information on the 2016 race, visit www.capepioneer.co.za.